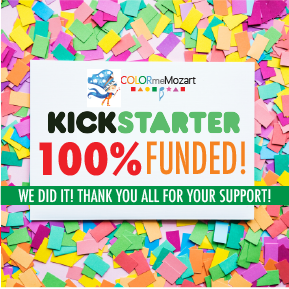 Color Me Mozart Kickstarter Campaign Fully Funded! Where do I even begin? Probably a million thank you's may be a good place to start. Thank you! With that said, I am so happy to announce that the Color Me Mozart Kickstarter Campaign is officially over and fully funded! It's been a long but amazing last 30 days with the Holidays coming and going and a new year beginning. We couldn't think of a better way to get this year started. Both the Kickstarter campaign was a success and our first fundraiser for the Color Me Mozart Foundation was also a success. Seeing everyone help out and be so generous has been very humbling and beautiful to see. What motivates me personally the most is being a part of something so special. Being able to provide music to families and schools is something I find so extremely important. Especially in a day and age where we are all glued to our phones (myself included). I feel it's ,ore important than ever to keep creativity and imagination alive in kids and adults too. I've been fortunate to hear so many stories during the Holiday of the joy of music. Many parents have shared with me how music has changed their child's life. Many special needs children are able to use music to communicate, express themselves and experience the simple joy that music has the power to do. Luckily, I get to see daily, the effect that music has on children, both in classrooms and at home. Singing a song together, learning to play an instrument, these are things that as humans we can relate to. I often think of how a song may take me back to a memory stored deep in my mind from many years ago. It's so fun to think that we are providing that same experience to children that one day they will hear a tune and be transported back to their childhood. We get to have a part of that story in their lives. How cool is that! Now that we've reached our goal for this campaign, what's next? Now comes the fun part. For the book, there's more designing to do, formatting and illustrations to add. Fortunately, the process is so much fun, that it doesn't even feel like work. Over the course of the next few months, we will add all the details and print out a few prototypes to make sure everything looks just right. Since the beginning, I wanted to make sure we were offering not only great music educational books, but also a beautiful visual experience as well. Our illustrator, Paula de la Cruz is amazing at what she does and you will love her new drawing for this book. The xylophone is designed and ready to go. The next step is confirming with the manufacturer or the specs of the instrument. Since we need a custom xylophone to match the colors of the book, everything has to look just right. I will say that you better get ready for lots of xylophones because they're coming. Can we store some in your garage? lol! 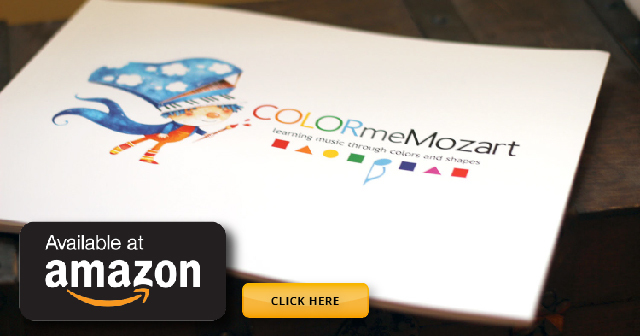 We are also excited because there are some schools that are ready to implement the Color Me Mozart program. With an additional teachers manual that we are also designing at the moment, schools will have all they need to easily add a music program for their students.